1. Importation of GMO Shellfish (S465) PASSED 93 to 2 - This bill allowed the importation of genetically modified shellfish, for example lobster and scallops, into South Carolina. I do not support messing with the DNA of organisms and I see consumer protection in this area as a valid responsibility included in state sovereignty. I voted NO. 2. CWP Recognition Reciprocity (H3240) PASSED 85 to 23 - This bill, introduced by Rep. Alan Clemmons, originally would have recognized all concealed-carry permits in South Carolina. Rep. Eddie Tallon introduced an amendment to recognize only concealed-carry permits from states that already recognize SC permits. I voted against the amendment but it passed. Nevertheless, the bill itself was a net positive for gun rights, so I voted YES. 3. Liquor at Baseball Games (S334) PASSED 55 to 46 - Though this vote was controversial, I believe it was the right decision. Among other provisions, this bill allowed hard liquor to be sold at baseball stadiums during a game, without clear rules of any kind. Baseball is culturally perceived to be a family-friendly environment and children are always present, sometimes without direct adult supervision. While beer and wine are already allowed at baseball games, making hard liquor available arguably changes the atmosphere entirely. It should be noted that this is not the same situation as a private restaurant; baseball stadiums are paid for at least partially by municipalities, which are under the jurisdiction of the state legislature. Thus, in this sense I believed I needed to vote as a trustee of the property. I voted NO. 4. Farm Protection Against DHEC (H3929) PASSED 77 to 12 - I was a cosponsor of this bill which would protect our local animal farms from overreach by DHEC, as well as provide immunity from certain frivolous lawsuits. Many of the farms affected would be poultry farms. Swine farms were not covered by this bill. Despite a last-minute surprise attack from the environmentalists, the bill passed and was sent to the Senate. I was happy to vote YES. 5. 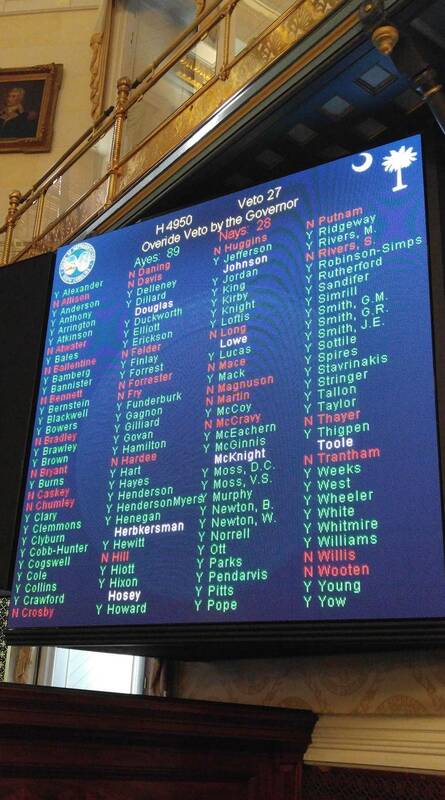 Gas Tax Hike Veto Override (H3516) PASSED 95 to 18 - I did not believe the legislature should override the Governor's veto of this enormous tax increase bill that did not include sufficient reform and added confusing imbalanced tax credits. Instead of providing a clean fix for our roads, the bill arguably entrenched the crony system further that caused many of the problems in the first place. I received dozens of emails from constituents in opposition to the bill, with only maybe 5 to 10 in favor of it. I voted NO. 6. Child Safety Seat Mandate (H3864) PASSED 70 to 24 - This bill tightened the requirement that most children while riding in a vehicle be put in "safety seats" until they are eight years old. Further, it tethered state seatbelt laws to Federal recommendations, so that whatever the Federal government suggests about vehicle restraint systems will automatically be implemented in South Carolina. Since this is outrageous, I voted NO. 1. Alcohol Sales Beside Schools (H3549) PASSED 74 to 17 - Currently, state law prohibits the sale of alcohol within 300 feet of a school property. This bill would allow a local school board the choice of whether to allow the sale of alcohol within that area notwithstanding. Since I know there are business interests that would immediately put pressure on many school districts, and since I don't believe alcohol should be made more available to children, I voted NO. 2. Entire Gas Tax Bill Added to Budget (H3720 Amendment 2a) PASSED 87 to 22 - Rep. Gary Simrill made a motion to add the entire gas tax bill (H3516) to the annual state budget as an amendment. This was a power move intended to force the hand of the Senate. This Washington D.C.-style move has long been regarded as inappropriate and took the chamber by surprise. Rep. Neal Collins raised a point of order that by state law, an amendment that raises a tax cannot be added to the budget. Speaker Jay Lucas proceeded to read a prepared statement explaining why the gas tax hike was a user fee regulation, not a gas tax hike. He then overruled the point of order and called for the vote on the amendment. Because I am against the gas tax hike bill for reasons I have often expressed, and because I believe the way it was handled violated state law, I voted NO. 3. Autism Insurance Mandate (H3790) PASSED 83 to 21 - This bill was initially a simple legal definition for autism to ensure clarity. A surprise amendment was introduced by Rep. Shannon Erickson that changed the bill's purpose: it restricted citizens from buying any insurance that does not cover autism. From the way the bill was worded, it seems its author believes in government control of healthcare. Since this bill is a clear violation of the fundamental liberty of contract, follows from the same twisted reasoning that justified Obamacare, and was introduced in an arguably underhanded manner without time for due consideration, I voted NO. 4. Immunity for Drug Victims Seeking Help (H3818) PASSED 93 to 0 - I was a cosponsor of this bill, introduced by Rep. Eric Bedingfield. It provides that someone suffering from a drug or alcohol overdose, or acting on behalf of someone suffering from a drug or alcohol overdose, cannot be arrested for most drug crimes while seeking medical attention. It's important to note that these provisions do not allow people to get off scot-free because the bill still allows evidence to be seized and prosecutions are possible later. Because this bill would save lives by allowing medical emergencies caused by drugs to be treated as medical emergencies, I voted YES. 1. Contraceptive Health Insurance Mandate (H3809) PASSED 64 to 38 - This bill would require insurance companies and Medicaid to pay for a twelve-month supply of contraceptives at a time instead of the usual 30 days at a time. A compelling case for the need was made in committee and I voted for this bill there. After more careful consideration however, I realized this is a government insertion into the insurance market similar in concept to Obamacare. Though I don't have an objection to contraception (provided it does not cause abortion), putting the state in command of what health care coverage must be offered by a private company is not an answer consistent with liberty. I voted NO. 2. Prescription Drug Monitoring Process (H3824) PASSED 97 to 0 - Rep. Phyllis Henderson introduced this bill which is part of a large-scale plan advanced by Rep. Eric Bedingfield and others in an attempt to handle the rising heroin/opioid epidemic in South Carolina. This bill requires doctors to review a patient's medical history before prescribing Schedule II drugs. It also requires doctors, dentists, and pharmacists to take continuing education classes on how to deal with opioids. In some cases, doctors' only information on opioid drugs has been from the pharmaceutical companies that stand to profit from the use of these drugs. This is an attempt to ensure doctors are not as easily pressured, and have all the information they need to make decisions. I voted YES. 3. Education Accountability Guidelines (H3969) PASSED 104 to 5 - I recognize the tremendous need that exists for better accountability and transparency in our schools statewide. However, I did not see that this bill achieves that goal. It is more of a "musical chairs" approach that does not address root issues in my perspective. Further, though the bill removed old No Child Left Behind language, it adds two clauses that grandfather in all future Federal regulation on school ratings: Section 5(7) and Section 11(D)! As someone who does not believe the Federal government should have any role in how families train their children, those provisions alone were enough for me to oppose the bill, and I voted NO. 4. Constitutional Gun Carry (H3930) PASSED 64 to 46 - Currently, South Carolina stands alongside only four other states that do not allow any form of open carry: California, Florida, New York, and Illinois! This means that here, like in these four liberal states, you can be arrested on sight if someone sees you in public with a holstered handgun. How ridiculous! Constitutional Carry eliminates the presumption that an armed South Carolinian is a criminal. It allows open carry and repeals the requirement to obtain a permit for concealed carry. The Second Amendment doesn't say, "The right to keep and bear arms shall not be infringed except if you can't get government permission." This bill wouldn't allow felons or trespassers to carry guns - it would merely stop the current policy of prior restraint on the rights of citizens. I was a cosponsor and I voted a strong YES. 5. Liquor Tasting Rules (H3137) PASSED 93 to 13 - This bill would expand the allowed total amount that can be served at a free liquor tasting event from one and a half ounces to three ounces. Though I do not believe alcohol is an evil in itself, and though it is not my position that the state should further restrict alcohol, I also realize the grave danger that alcohol can pose, and am committed not to encourage it whether personally or with state policy. In this case I believe the bill would encourage not only alcohol use but drunk driving, since my understanding is that three ounces of liquor is usually enough to pass the legal limit, and since it would be unlikely that someone would designate a driver at a free tasting event. This is an area where I believe extreme caution is justified. I chose to vote NO. 6. Expungement of Criminal Records (H3209) PASSED 103 to 0 - I was honored to be a cosponsor of this criminal justice reform bill introduced by Speaker Pro Tempore Tommy Pope. This bill would allow the expungement of first-offense drug violations, and the consolidation in the record of certain other non-violent crimes, upon approval by the appropriate officials. I believe this is an important first step toward greater fairness in our legal system, and I was thankful for the chance to vote YES. 7. First Responder Gun Carry (H3566) PASSED 80 to 8 - This bill would create a one-week training course at the Criminal Justice Academy that could certify first responders such as paramedics and firefighters to carry a gun onto school premises. Since schools are usually "sitting duck" gun-free zones and are therefore increasingly becoming the targets of gun violence, and since in rural communities a neighbor who is a volunteer fireman may often by the first person on such a scene as was the case in the Townville shooting, this was a needed measure. I voted YES. 1. Restorative Juvenile Justice (H3055) PASSED 97 to 4 - This bill established a study committee to research how to do a better job preventing students from dropping out of school and ending up in crime. It also created a training program for school resource officers and instructed the Department of Juvenile Justice to create an accompanying training curriculum. I believe the safety and success of our students should be a priority for our state, so I voted YES. 2. Farm Intrusion and Inspection (H4003) PASSED 100 to 11 - Though some measures were taken to ensure that this bill would not impact small local farmers, I believe it nonetheless represents a dramatic intrusion of government into private affairs. The bill allows the Department of Agriculture to enter certain farms during any "reasonable hours," inspect food and farming equipment, copy farm records, and demand the destruction of any produce they deem to be unsafe. I believe this is a terrible idea that restricts liberty. Worse, the bill was passed essentially without debate - I think a lot of us didn't know what the bill was until it was right in front of us. I voted NO. 3. School Facilities Funding (H3343) PASSED 107 to 1 - This bill authorized the state to issue bonds to pay for improvement of school facilities, provide incentives and grants to school districts where need exists, and require school districts to report how all funds under this program are used. Though philosophically I believe we need to move toward more parental control of education rather than expand state influence, and though as a rule I do not support anything that allows for a debt increase, the legislature is required by our South Carolina constitution to adequately fund public education in all parts of the state. This bill is part of a response to a court ruling on that responsibility in what is called the "Abbeville" case. Though better solutions no doubt exist, I believe the bill addresses an urgent need, and I voted YES. 4. Limiting Industrial Hemp (Motion to table an amendment to H3559) FAILED 32 to 74 - The Industrial Hemp bill, H3559, would authorize the growing of hemp fiber in South Carolina, which is currently illegal. Rep. Mike Pitts introduced an amendment to increase the number of hemp farming permits that could be issued to fifty total, and expand the number of acres each farm could use. I think this is a needed amendment to ensure that hemp farming can become a widely available field for our citizens instead of a crony business only accessible to a handful of folks. I voted NO on the motion to set aside this important amendment - in other words, I voted to keep the amendment. The amendment was later removed, however, and I continued to support the bill, which passed the House. 5. Abolish Abortion-By-Dismemberment (H3548) PASSED 83 to 17 - Rep. Lin Bennett introduced this bill to eliminate the cruel practice of killing children by tearing them apart while they are still living. It would require that a child must be killed by poisoning before he can be mutilated in the womb. This bill does not restrict abortion per se, but it is significant because Planned Parenthood and other entities that sell human tissue acquired through abortion can only profit if that tissue is still living. In effect this bill if it becomes law would pull the rug out from under the abortion industry in South Carolina. This bill was debated all Wednesday afternoon and evening. Thankfully, we finally got to a vote and passed it. I voted a strong YES. 6. Background Checks for Real Estate Agents (H3041) PASSED 103 to 0 - This bill requires all Real Estate agents to receive a criminal background check every six years from the FBI and SLED. This is a response to the tragic murders uncovered recently here in Spartanburg County, to which Todd Kohlhepp, a Real Estate agent, confessed. I voted YES. 7. Home Owners Association Reform (H3886) PASSED 91 to 0 - This bill addresses alleged HOA abuses by requiring HOAs to make available their full documentation and bylaws to a potential home buyer, and establishes an ombudsman to answer questions and hear concerns about HOAs in South Carolina. I voted YES. This week the only issue was the state budget. If we only include the portion funded by income tax and sales tax - the "General Fund" - the budget that was passed for 2017-2018 is about $8 billion. But if we include all sources of funding, including Federal money, the total budget for this coming year is over $27 billion. I voted against a number of programs I believed to be wasteful or outside of the state's responsibilities. Counting up only the waste, the amount of money I would have saved had my NO votes succeeded would be about $703 million in annual expenses. To put that in perspective, the proposed gas tax increase is supposed to generate around $600 million annually when fully implemented. So if only we were willing to cut some wasteful spending, we would have the full amount we supposedly need to fix the roads, and then some extra! About a quarter of the votes on this record-breaking spending turned out to be ones where my conservative friend Rep. Jonathon Hill from Anderson County and I were the only two NO votes. You can find my full voting record when you click here and go to "Find Votes" at the bottom right. But what was even more interesting was how a debate occurred on abortion funding. Rep. Steven Long, of Boiling Springs, and I introduced a total of four amendments to the budget to prohibit the state from paying to kill children. Because of a variety of wrinkles that became apparent later in the day, I did not press for my two amendments. However, I spoke against this State Health Plan portion of the budget and voted NO. You can watch my speech here. I am told I achieved the highest-ever number of votes not to fund this line item of the budget funding abortion. 1. Moped Restrictions (H3247) PASSED 75 to 29 - This bill put a number of new restrictions on moped drivers. I can get as annoyed as anyone with mopeds when I'm trying to get somewhere on the road. Nonetheless, I don't support further government restrictions on travel, and I realize there are a lot of disadvantaged folks who depend on mopeds. Thus, I voted NO. 2. Plastic Bag Power Grab (H3526) FAILED 49 to 50 - This bill would prohibit local communities, cities, and counties from making ordinances on plastic bags and other "auxiliary containers." I saw this as a power grab from the state. I don't think legislators from all over South Carolina should be telling coastal neighborhoods what is best for them. There was not a convincing case that plastic bags should be a statewide issue, so I voted NO. Note that procedurally what happened was we "continued" the bill which means it will come back up again next year, which I believe is a good thing because we may have more information at that time to make a final decision. 3. Fake Crackdown on Anti-Semitism (H3643) PASSED 103 to 3 - Let me preface this issue by saying I absolutely support Israel, and I very much love Jewish people and culture. However, this bill that allegedly addressed rising anti-Semitism had numerous flaws. First, the bill had no substance - it simply cited a definition for anti-Semitism and made it available to be used by college campuses. Second, to the degree the definition would change anything, it would not be a benefit, because the definition says anti-Semitism is "a certain perception" of Jews, which is a slippery slope toward thought-crime. Third, the definition was not actually written in the bill, but rather cited in a Federal document, leaving open the possibility for the definition and thus the law to be stiffened by the Federal government later. Fourth, I do not believe trying to protect "groups" or "races" is consistent with conservative ideals. Conservatives strive to maintain liberty for ALL individuals. We recognize that all crimes are hate crimes. We realize that if we simply enforce existing laws fairly, no special categories of people need to be created. For these reasons I voted NO. 4. Open Bids on Piping (3652) PASSED 55 to 47 - A number of cities in South Carolina have ordinances stating what kinds of pipe they can use in their waterworks - usually iron. This bill simply said that anyone who receives state funds for their piping must open their bids to all materials. The managers and engineers retain complete discretion as to which pipe material they ultimately choose. Though I'm not sure this bill will have much of an effect, since it's basically just a suggestion, the only possible effect I could see was in the direction of a freer market and more competition, so I voted YES. 1. State Pensions Bill (H3726) PASSED 99 to 14 - By conservative estimates, our state retirement system currently faces a shortfall of $25 billion. This act was a stab toward fixing that problem. However, the act did not adequately address the area of investment mismanagement, it greatly increased the employer and employee contribution rates, and it removed Curtis Loftis from the Investment Commission - the one who sounded the alarm about the pensions in the first place. I did not believe this act provided a solution to the problem, but what it would do is transfer the burden of the state's mistakes to local governments. Thus, I voted NO. See the vote tally here. 2. DOT as a Cabinet Agency (H3516 Amendment 9) FAILED 33 to 84 - The people of South Carolina have made it clear that they want the Department of Transportation to be as accountable to the public as possible. The best way to provide this accountability would be to make the DOT Secretary a Cabinet position, hired directly by the popularly-elected Governor. I was the one who called for a roll call vote on this issue so that you could see where your legislator stood. Though most legislators did not take the stand you asked, I voted YES. See the vote tally here. 3. Rate Reduction on Vehicle Fee (H3516 Amendment 18) FAILED 22 to 79 - I introduced this amendment to reduce the vehicle fee (aka sales tax) to 3% of the price, and raise the cap on the fee to $700. Current law has a 6% rate with a $300 cap. This means under current law, purchasers of an expensive new car pay a lower tax rate than purchasers of a used car. My amendment would have moved the ball in the direction of equity, so that the wealthy are charged the same rate as the poor, rather than far less. I gained bipartisan support for the measure. However, it could not overcome opposition from leadership in both Democratic and Republican parties. I was told the reason Republican leadership killed the measure was the special interests had already negotiated the details of the gas tax bill. But I pressed for a vote to see who stood with the taxpayers and naturally I voted YES to my amendment. See the vote tally here. 4. Gas Tax Hike Package (H3516) PASSED 97 to 18 - This act coupled a series of major tax and fee increases, including a 10-cent increase on the gas tax over five years, to several reform measures. While it was a complex issue, and while I fully understand the serious need to fix our roads, this bill came up short. There were too many loopholes in the proposed reforms, the bill included no form of tax offset to make it revenue neutral, and the DOT Commission was left intact instead of making the DOT Secretary a Cabinet position as the citizens have asked. Because I realize no amount of money thrown at the problem will help until the issues of accountability and responsibility are answered, I voted NO. See the vote tally here. 5. Constitutional Gun Carry (H3700) FAILED 20 to 79 - Rep. Jonathon Hill used an unusual, though fully legitimate, motion to withdraw this gun bill from the Judiciary Committee where it has been stalled and debate it on the House floor. Some legislators voted against the motion because they said it was the wrong approach. However, I believe if we have rules, we should use them for the right reasons. I voted YES to this measure because I believe your Second Amendment rights are important enough to justify an open debate by the House. See the vote tally here. 6. Federal REAL-ID Implementation (H3358) PASSED 100 to 3 - In 2005, the Federal government passed the REAL-ID Act in an attempt to nationalize state identification data. The REAL-ID Act requires each state to collect biometric information on each citizen, which can be accessed by any law enforcement agency in the country. REAL-ID implementation would put the U.S. on track to comply with a United Nations plan called Agenda 2030, mandating a global biometric database. South Carolina stood up against REAL-ID in 2007. Along with 16 other states, we declared that we would not implement the Federal requirements. There was no constitutional justification for REAL-ID then, and there is not one today. Further, even though compliance would be "voluntary," I believe the door would be open for the trampling of individual liberty and privacy. In my studied opinion, REAL-ID is nothing more than a national, and possibly international, power consolidation. If you would like to hear further on my understanding of this issue, please go here, look at the right side and click on "Thursday, March 2 - House of Representatives", and then forward the video to 2:10:00. Because I believe a Yes vote would have violated my oath of office to preserve, protect, and defend the Constitution of the United States, I voted NO to the implementation of REAL-ID. See the vote tally here.